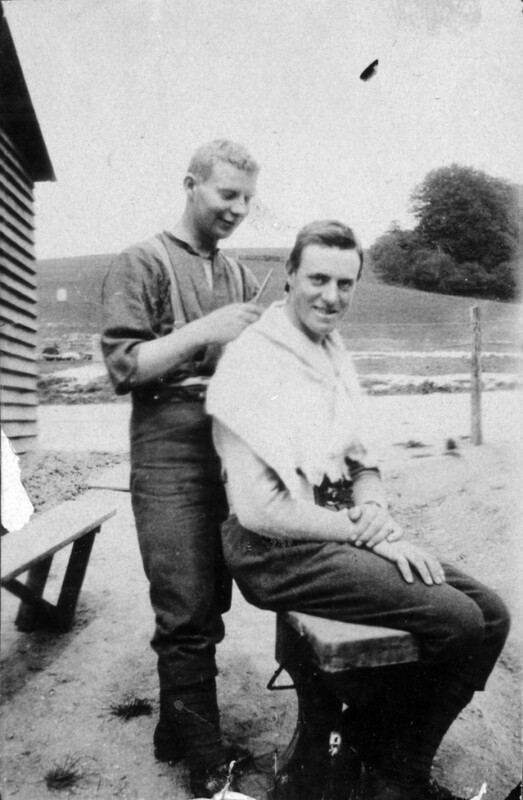 Ron Wakelin cutting fellow soldier Melve King’s hair, outside barracks at Codford Camp, England. Ronald Philip Wakelin was born in Carterton in 1897, his parents being Joseph and Catherine Wakelin. Before World War One he trained as a compositor/printer, following this trade all his working life. He served in the Senior Cadets and Territorial Army leading up to the war, and enlisted in August 1916, adding a year to his true age. Ron became part of the 20th Reinforcement (service number 30672), training in the infantry at Trentham and Featherston before embarking on 7 December 1916. He went to France in May 1917, joining the 3rd Battalion of the Wellington Regiment. Apart from a few periods of illness Ron came through the campaigns of 1917 and 1918 unscathed and returned to New Zealand in November 1919 with the rank of sergeant. Back in Carterton Ron became a volunteer fireman but continued as a territorial soldier. In 1923 he married Hilda Erskine. He began his own printing business in Carterton. When World War Two began, Ron was a captain in the Hawkes Bay Regiment. In November 1941, as war in the Pacific looked likely, he was promoted to temporary major and transferred to the 1st Ruahine Regiment which was forming in Solway Showgrounds at Masterton. Ron remained a training officer until 1944, serving also at Linton Camp. He was elected Carterton’s mayor in 1947 and he held this position until 1971. He was made an MBE in 1963. Ron Wakelin died in 1979 and is buried in Clareville Cemetery.